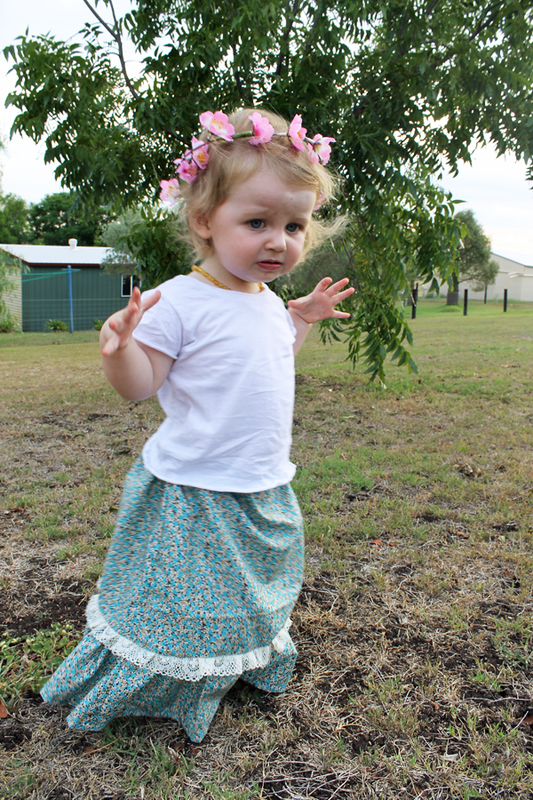 A little while ago I volunteered to test the ruffley goodness that is the Wee Muses's Prairie Rose Set! 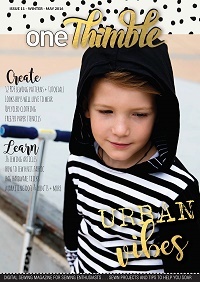 Wee Muses is a pattern company by the ace of all trades Anneliese of Aesthetic Nest. Well life got in the way and I dropped the ball with the pattern testing. I felt just awful, so I was really stoked when Anneliese asked if I wanted to sew something up for her Prairie Rose Set pattern tour! Anneliese is such a sweet person, so kind and patient with someone like me! Her blog is one I follow, and just read in envy that I could ever be so graceful, classy and just so good at everything! 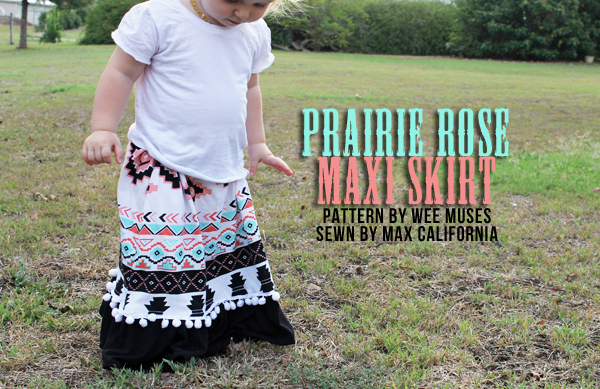 I think I am the total opposite, so today I am bringing you the Prairie Rose Set, Max California style! The first one I made up I nearly died when I put it on her. 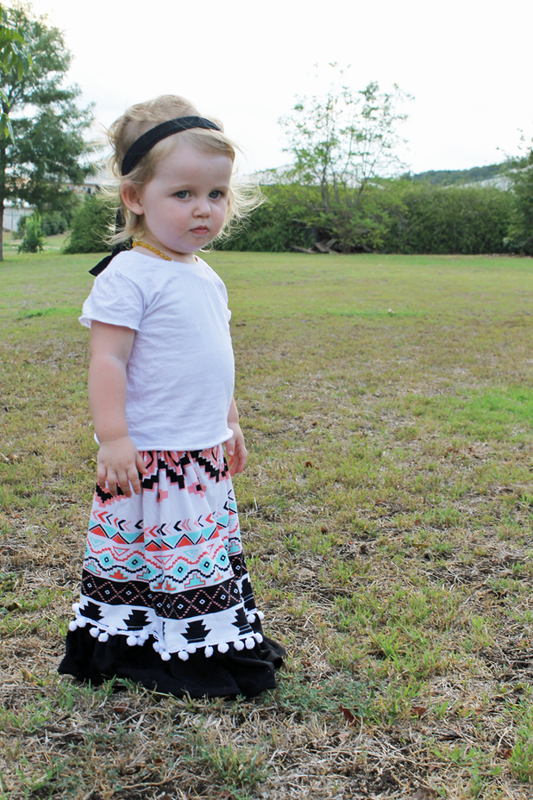 I hadn't made her a maxi skirt because whenever I thought to make one it was when she was crawling and/or trying to figure out how to walk. 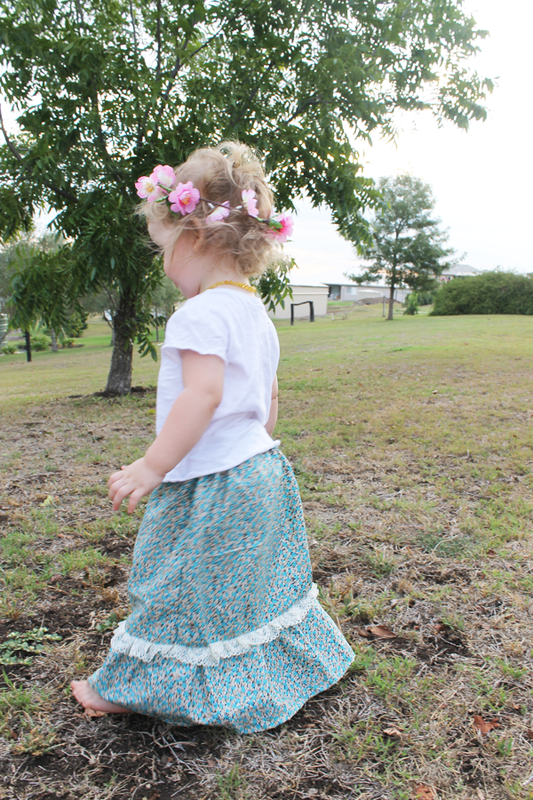 However now she is pretty much running and does gymnastics, so I'm pretty sure she is more than capable of wandering around the prairie in her new maxi skirts! 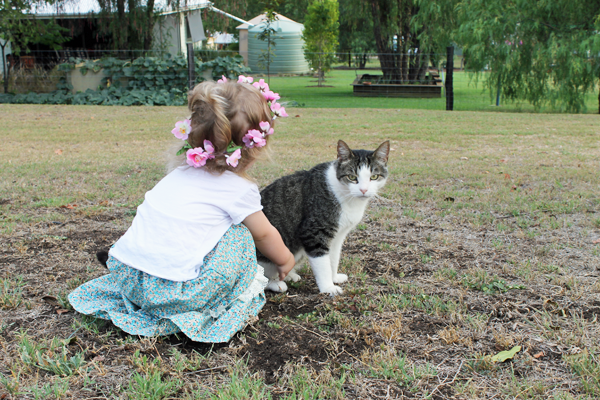 I used a pretty blue floral cotton I bought from the op shop last week. I scored 3metres for $5 and oh my goodness I am in LOVE with it. 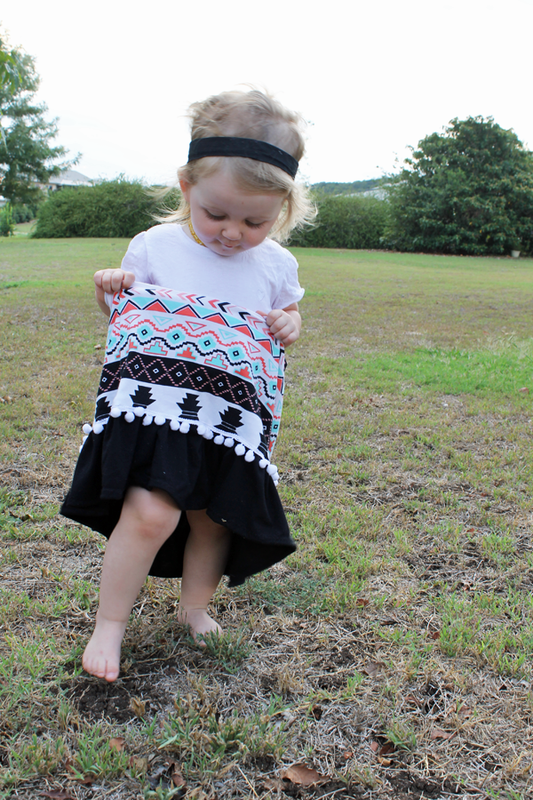 The skirt was such an easy and straightforward sew, and you know when I make more than one of something it means it's a keeper! 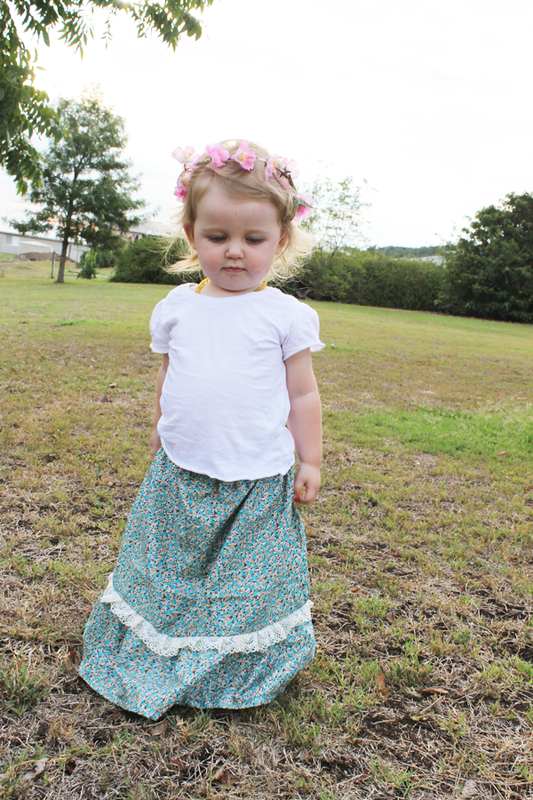 This Prairie Rose Maxi Skirt? Keeper! I sandwiched some vintage-esque (or maybe real vintage? who can tell these days!) lace between the skirt and the ruffle just to see what would happen. 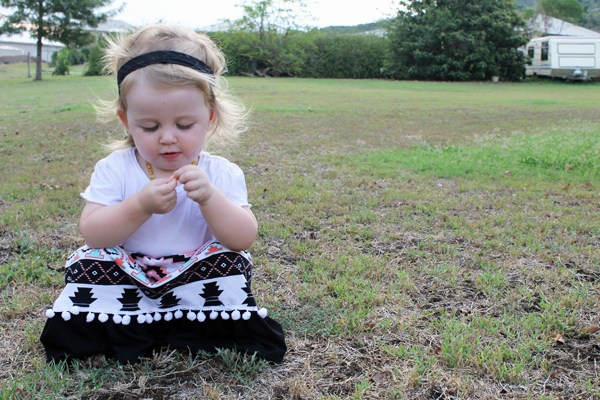 What happened is the cutest little country girl style skirt I have seen! The second skirt was even quicker, it's always that way once you have made something one time isn't it! 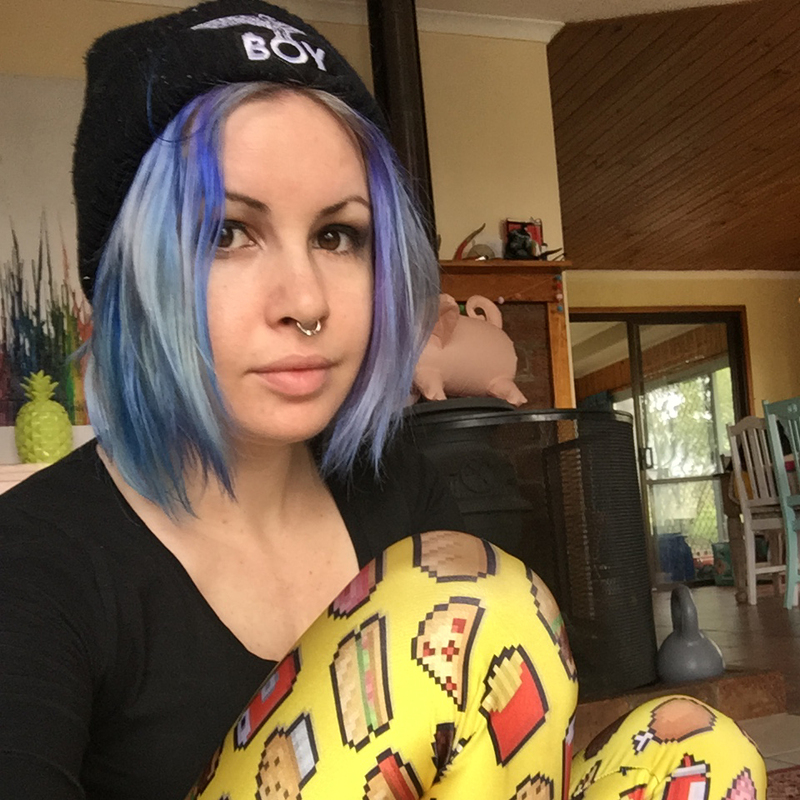 I used a t-shirt I got at this wicked op-shop trip I did a few weeks back (I found two amazing secondhand stores in a small country town about twenty minutes from my new home!) for about $2. I actually scored quite a few tribal/aztec-inspired print shirts and skirts on that trip, I'm excited for future reconstructions! I used the bottom of a black t-shirt (I swear there aren't enough black t-shirts in the world for me to cut up, Or black stretch fabric!) for the ruffle and stitched some white pompom trim around the joining seam! 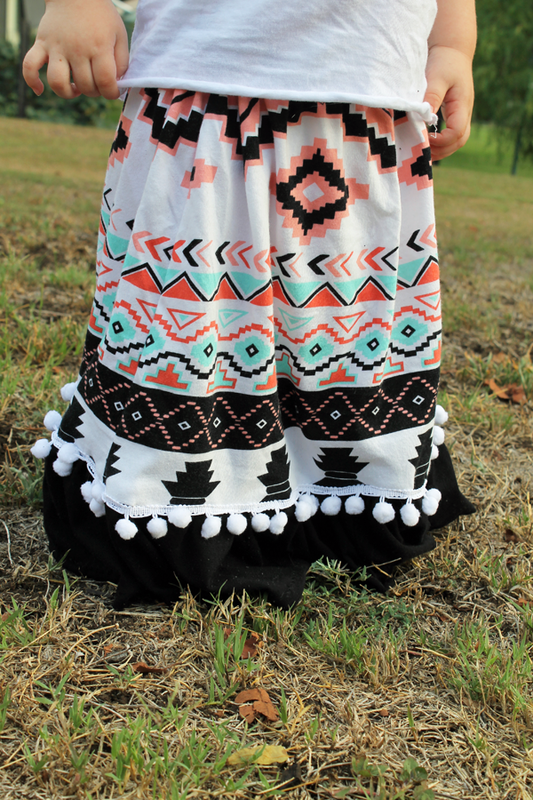 I decorated both skirts, but seriously this looks so cute without the trims also! 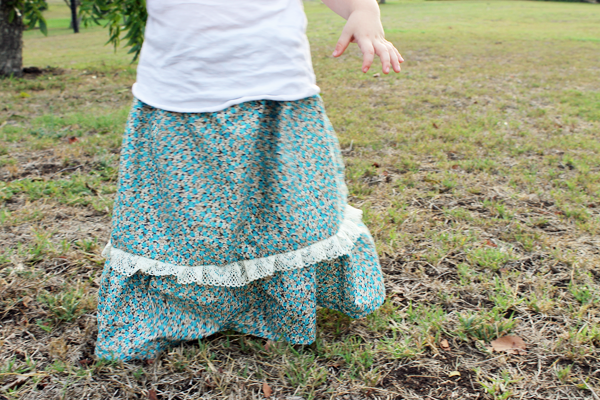 I love how both skirts have such radically different looks! The floral one is classic, the aztec-ish one is trendy. It's been so hot here and we're all hanging out for winter (which I'm sure everyone will start complaining about it being so cold haha), so I am actually really excited for Eddie to wear these layered with her leggings and boots for warmth as well. 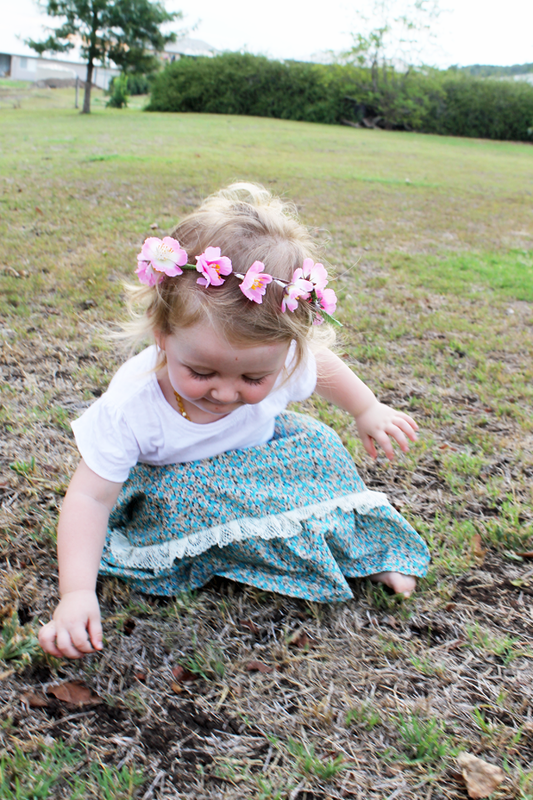 You can get the Prairie Rose Set right here, and see more beautiful photos of Anneliese's adorable little trio of wee muses on her website here. There were a few bloopers, but this one is my favourite because Ouchie! She stepped on a prickle right after I asked her to stop walking around! Poor babe! I am ga-ga over this! She is so so beautiful! And this landscape?! So romantic, pastoral... You have done amazing work. 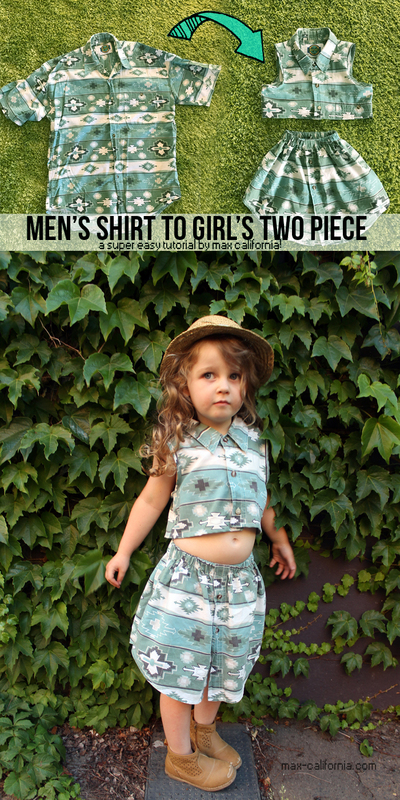 Thank you so much for sewing with this pattern--and for making 2! I am torn as to which is my favorite--I love them both. Max California style rocks! How fun! 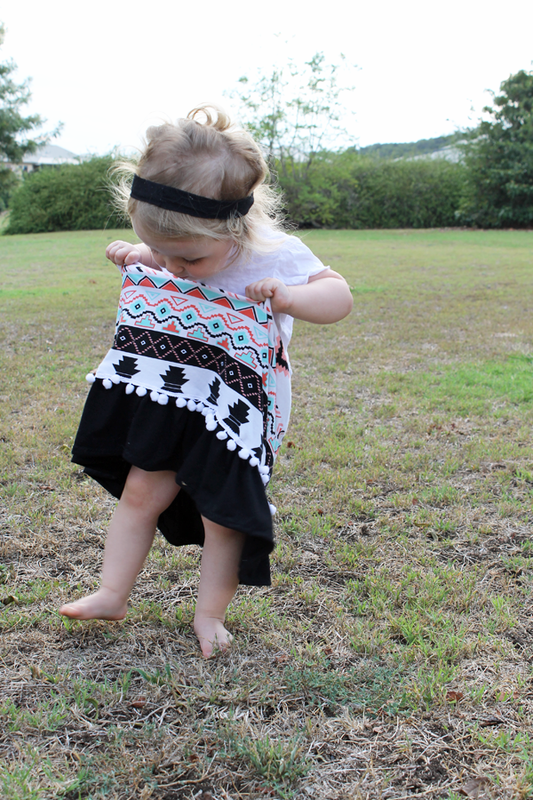 The Aztec print is probably my favorite one, its so on trend :) . And goodness what an adorable model! That is just too adorable! 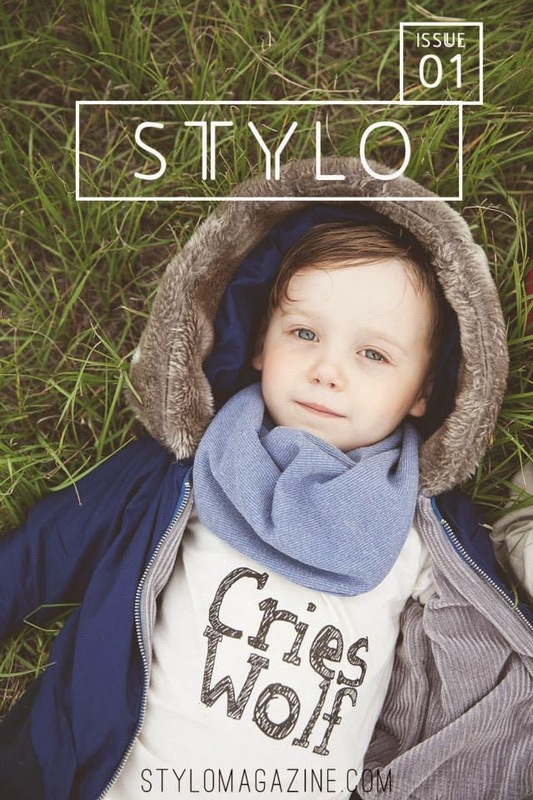 What great interpretations, and they totally suit your sweet little one! 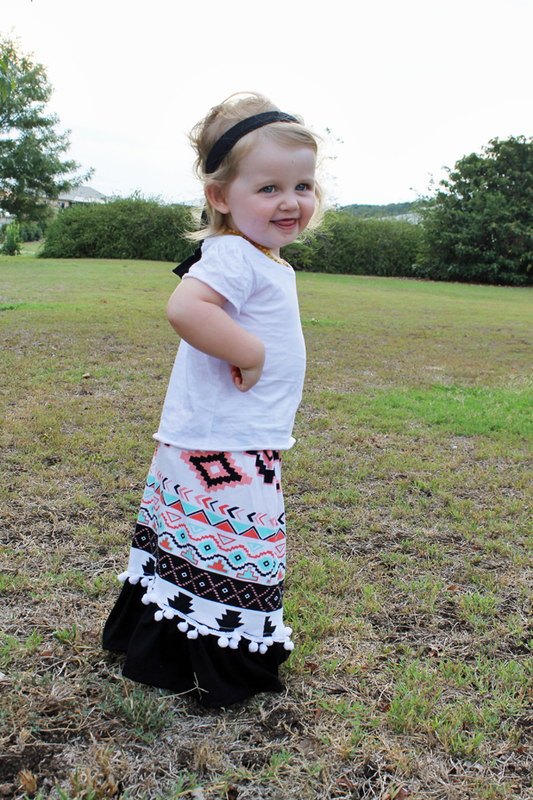 I think your little one will be able to wear these skirts for a long time--as she grows it can become a midi skirt and still be cute.